USA Hockey provides the foundation for the sport of ice hockey in America; helps young people become leaders, even Olympic heroes; and connects the game at every level while promoting a lifelong love of the sport. 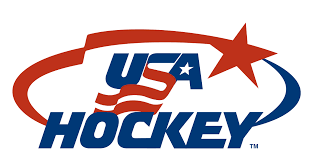 For more information about USA Hockey, please click on the logo below. The ADM is USA Hockey’s nationwide player-development program for youth hockey associations. It’s based on age-appropriate, age-specific competition and training for boys and girls, beginning with their first steps onto the ice and carrying them through age 18 and beyond. The ADM places a heightened emphasis on skill development and long-term athlete development principles, providing a blueprint for the best possible youth hockey experience. For more information about ADM, please click on the logo below.